An Asian cruising guide with details on Asia cruise schedules for 2019/2020 and some river cruises, touching ports as diverse as Hong Kong, (with its new cruise terminal), Malé, Singapore, Penang, Saigon, Manila and Shanghai. Cruise ship at sunset. The latest behemoths serve up seven storeys of accommodation and play with solariums, bigger swimming pools, extensive gardens with trees, and family suites with slides and more. INTO that beckoning blue yonder we go. But, where once were the blue-rinse set and stampedes for the buffet with grannies planting knobby elbows in your eye as they fought for the last bits of pie, now stand sharp-profiled wind-in-the-hair celebrities waiting to take selfies with you. And yes, there's selfie-sticks galore as you jostle with the crowds beaming at their cameras or iPhones or, more likely, the latest Samsung, Xiaomei or Huawei models. Chances are you might not have time for either pie or the celeb hobnobbing as you’d be far too busy checking out some monstrous credit rebates as cruise lines woo your extraordinarily dear custom. While air travel hits stratospheric prices, ocean cruises have become wonderously afforable as cruise lines fret over empty cabins. Of course, cruise rates run into thousands of dollars but now you can look forward to US$1,000 or more credit per person for onboard use as well as huge air credits if you hunt in discount stores and online agencies like Cruise.com (www.cruise.com), Just Cruises from Australia (justcruises.com.au) or American Discount Cruises (www.americandiscountcruises.com). Vacations to Go (www.vacationstogo.com) has offers of up to 82 percent off with shipboard credits, shore excursions and more, though much of this rerlates to Mexico, the Caribbean and the Mediterranean. Shop around. There’s lots of choice. And always read the fine print. By 2018 holiday rate drops of 10 percent or more were not uncommon. Watch for price drops at Cruise Fish or download the ShipMate app and gaze at your phone whenever you get a break. Behemoths continue to stride the seas. More goliaths join the scene almost annually, like the 4,000-passenger Disney Fantasy with its elaborate Aladdin musical, the Oceania Riviera, Carnival Breeze and Celebrity Reflection. The Norwegian Breakway, newest of the extensive Norwegian Cruise Line fleet, Quantum of the Seas, and the Royal Princess are also relatively new on the cruise ship block. The 'newest' Queen Elizabeth arrived October 2010 to carry on the Cunard baton with a reassuring heft of 92,000 gross tonnes offering more cabin comfort and entertainment for over 2,000 passengers. It flies a quintessentially English flag with frilly garden parties, croquet matches and exceedingly “propah” ballroom revelry. But Royal Caribbean has thrown a bawdy counterpunch in the form of the Allure of the Seas that emerged from the Florida waves to launch a lavish Las Vegas-meets-Disney experience complete with parading DreamWorks characters, jazzy Broadway musicals and over 400 slot machines. Ditch your dinner jacket and don a helmet as you float along a zip wire, rock climb or ice skate on this 225,000-ton mega-ship. Sailing against the trend of smaller scale boutique cruise lines, Royal Caribbean has sent monster ripples through the industry with the launch of these two huge ships. A whopping 1,187ft long and holding just shy of 6,300 passengers, Allure of the Seas has 21 swimming pools, 20 restaurants and 17 bars (including one that doubles as an elevator). Now that’s BIG. You can surf in a wave pool, play mini-golf, jog around the half-mile running track or admire 12,000 plants in the football pitch-size park. Royal Caribbean is a leader in the social media charge. Passengers can instantly upload selfies from the middle of the ocean on the new Quantum of the Seas, which has added high bandwidth WiFi (with access costing around US$21 per day). Quantum, which set off on its maiden voyage in 2014, also offers a skydiving experience, extendable observation arm, and disco roller rink. Qantum of the Seas hastypically four and five-day sailings from Shanghai touching places like Busan, Fukuoka, Hiroshima, Kobe, and Kumamoto. Royal Caribbean's itineraries include a 14-day Singapore-Sydney, a 12-day New Zealand cruise, and a 14-day New Zealand including the Milford Sound. In October 2019 Quantum has a 12-night cruise Tianjin to Singapore priced at US$1,140 taking in Hong Kong, Danang and Ho Chi Minh City. Dream Cruises (from Genting Hong Kong) has set up shop as an Asian luxury cruise lineto attract top-drawer audiences from China and other wealthy Asian source markets. Genting Dream, the first of the new fleet, launched sailings November 2016 from Nansha (Guangzhou), its home base. Most of the staterooms in this megaship (serviced by over 2,000 crew) will offer spacious private balconies. There are also 100 connecting rooms for families. Also think 35 restaurants and bars and a lavish wellness set-up with reflexology and over 20 rooms for spa treatments and massage. A Dream Suite houses four in 37sq m but you can move up to a 56sq m Dream Executive Suite or the palatial 224sq m Garden Penthouse with a large private balcony, a whirlpool spa, butler service and three large flatscreen TVs for everyone to enjoy their own shows. There's a Little Pandas Club for kids too as a child-friendly touch for overworked parents. Gratuities for a five-night cruise in a Dream Suite including Guangzhou, Danang and Halong Bay will run at Rmb110 (adults or over-13s), and Rmb55 for kids. No gratuity is charged for children below seven years old. Balcony Class gratuities run at Rmb90 for adults. Impressive yes, but does size really matter? Silversea Cruises clearly thinks otherwise and its Silver Whisper offers an intimate sailing with only 382 passengers while P&O’s latest cruise liner, Adonia, invites a cosy 710 onboard. Then there is the all-apartment ship, The World, which even offers its residents the chance to personalise their voyage with bespoke itineraries. 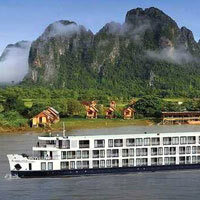 Movement is not just on the open seas; Asian river cruises are gaining traction as well. More than a dozen boats joined the river flotilla in recent years, many of which head through Asia. Explore trips through Vietnam and Cambodia, along the Mekong River from Uniworld’s 60-passenger River Orchid, as well as mega-trips to the Arctic Circle aboard Compagnie du Ponant’s Le Soléal. Championing the cause of good things in small packages was the Hebridean Spirit (now replaced by sibling Hebridean Princess that trawls the waters off Scotland and Norway but not, alas, Asia). With only 50 passengers, the dedicated service and relaxed privacy made this ship a champagne choice. Asian cruises, as anywhere, require careful homework to sort the wheat from the chaff, the wallet bending from the truly wallet shattering. Armed with specific knowledge, an Asia cruise can be a highly enjoyable experience. So on with our Asian cruises guide from the small and the saucy to the big, the bold, and the brash, and a look at some cruise schedules touching the Pacific and Indian Oceans. What are you looking for in an Asian cruise? Some passengers cruise for exotic destinations. Others go to sea for the thrill of the voyage. Fun can mean professional cabaret every evening, casinos, quizzes and casual dress, or it can mean an elite country-club atmosphere, quiet formal evenings and erudite lecturers. While glitzy cruise liners boast lavish buffets and spectacular entertainment for hundreds of passengers, queues at ports-of-call can be laborious, as are jam-packed sundecks. On the other hand, a smaller ship with only one bar and restaurant, could limit your activities and, more worryingly, your choice of company. Cruising can cater for everyone – even for merry widows with gentlemen hosts on call for dancing – but first-timers should think carefully about what they get for their dollar before signing up for that “holiday-of-a-lifetime” voyage. Rates for Asian cruises that really do include all the extras may at first seem high. However, extras like cocktails (plus 15 percent service charge), shore excursions (often more than US$100 a head), and tips of over US$20 per day per couple, can add a lot to the cost of the cruise. The basic component covered by a cruise fare is limited to the voyage, accommodation, meals and entertainment, so do allow for extras when comparing costs. Nasty surprises could include extras for government fees and taxes, port charges, fuel supplements, optional travel protection and incidentals like laundry, spa and salon treatments, purchasing those souvenir photographs and succumbing to the casino and art auction enticements. Minimum fares generally start around US$250 per person per day depending on the ship. Many companies advertise discounts in their brochures and a good cruise travel agent could come up with less than the brochure price because of early or late booking discounts, loyalty programmes and volume pricing. 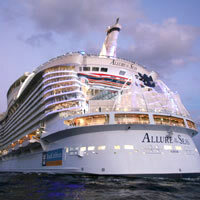 One of the leading cruise bookers is Atlantis International (www.ailcruises.com). Based in Florida, Atlantis International can get great deals with all cruise lines reviewed here, and specialises in Silversea Cruises. When poring over your Asia cruises brochures, always study the small print for extras. While companies such as Silversea, Seabourn and Regent Seven Seas state that tipping is not expected (but it will surely be accepted), some specify what gratuities are required. A suggested guideline for stateroom and dining service tips could be: stewardess in the region of US$5 (single travellers, US$6 per day), senior waiter US$5, waiter US$3, butler US$4, all per guest per day. There is no guidance about tips for the maitre d', head waiter, assistant stewardess and room service personnel, but US$7 per guest per dinner is recommended for those restaurants where a premium is charged. Passengers on Legend of the Seas can pre-pay gratuities per person per day, which start from 75 cents according to the type of service. On the Queen Elizabeth, Queen Victoria and Queen Mary 2 a "discretionary hotel and dining charge" is added to the bill of each passenger (including children), according to accommodation grade, plus 15 percent on bar charges and dining room wine. Costa ships add between seven and eleven euros per day (depending on the destination and length of trip) to a passenger's bill at the end of a cruise to cover gratuities. Princess Cruises add US$11.50 per person (including children) per day to the on-board bill and a 15 percent charge is added to bar bills, although these charges do not apply to cruising guests departing from Australia. Gratuities can be charged to the shipboard account while some ships provide envelopes in the cabins (and guidelines in the ship's daily programme) for tips to individuals at the end of a voyage. Another expense to prepare for when considering Asian cruising adventures is the tips for staff when you take a shore excursion. Legend of the Seas recommends that the Tour Director be tipped around US$3 and the coach driver US$2, both per guest per day. Princess Cruises suggests US$5-$7 for an escorted tour director (per day) but tipping is discretionary. In addition, some cruise lines require guests to pay port charges and government taxes and this could add as much as US$400 per person. With exchange rates on a trampoline, these notional numbers will vary considerably. Something new to budget for is the premium payable to dine in a speciality restaurant that features a theme menu (such as Italian, French, Thai or Japanese cuisine). This can range from US$15-$99 per person for Norwegian Cruise Line’s specialty dining options and 20 euros per person plus 15 percent service charge for drinks in the club restaurants on Costa cruise ships, to upwards of US$200 for a degustation menu with premium wines, on Silverseas ships. Norwegian Cruise Line (NCL) pioneered the concept of “freestyle cruising” which gives guests the option of eating in any one of several restaurants, only some of which attract a premium for extra service and broader variety of food. Their ships are child-friendly too, with lots of activities and attendants to keep children busy while their parents play. Keep them in mind for child friendly cruises for the family. The closest that NCL ships get to Asia is Hawaii, although older NCL ships have cruised in the Indian Ocean in the past, and could do so again. Check the NCL website for updates on their Asia/Orient cruises. Cruising is a wonderful option for the elderly – and the lazy – since unpacking (and packing) only has to be done once instead of at every destination, and getting back to the cabin at night after a convivial evening doesn’t require a taxi. Cruise ships also carry a doctor who holds daily clinics (for a fee, so have good insurance). The bigger ships with more organised activities are suitable for parents with children, who can be cared for by trained staff. Some, like NCL ships and Star Cruises, positively welcome children and have special meals and club facilities for them. Luxury smaller ships often have nothing special for children to do, and the predominantly older passengers’ tolerance of other people's kids may be low. Be aware that some small ships will not accommodate children below a certain age. Passengers with mobility problems will find better facilities on ships built after around 2003. These have a range of cabins designed for wheelchair users, and some even have electric hoists to help passengers get in and out of the swimming pool. Special cabins feature ramps and extra wide doors, grab bars and shower stools, raised beds and adjustable hanging rods in the closets and toilets. Some staterooms also feature alarms and communications systems such as vibrating alarms and closed system TVs for passengers with hearing and visual disabilities. All cruise ships have wheelchairs for temporarily disabled passengers (and a steward on hand to push) but these are limited to emergency onboard necessity – embarking and disembarking – not for exclusive use or for shore excursions. Cruising in Asia is the ideal holiday for solo passengers too, although some ships charge 175 percent of the per person rate for single occupancy of a double cabin. Solo passengers are often invited to dine at the captain’s or chief engineer’s table and since there are usually a good batch of singletons, there are ample opportunities for shipboard romance. There are often three formal nights on a 14-night cruise and this means a tuxedo or at least a dark suit for men. Informal, smart or elegant casual on other nights indicates that men should wear a jacket and not necessarily a tie. For elegant casual, Star Cruises insist “all gentlemen must have a collar with flap”. Casual nights allow for dressing down, but not shorts, except during the day. Crystal Cruises altered its formal dress code in 2014 to reflect a “continually evolving, more relaxed dress code reflected throughout the world”. Still though, no shorts or baseball caps permitted after 6pm. The larger ships have buffet restaurants operating in the evenings where dress is casual. The larger the ship, the more entertainment, with lavish shows, parlour games and casinos. Even the small yachts of Seabourn have cabarets and comedians, while Silversea vessels veer towards more classical evenings. All have musicians, either small groups or a bar pianist. Lectures are usually given in the ship's theatre or, in the case of very small ships like Island Sky, in the bar lounge. Silversea cruises revamped its entertainment options in a move away from typical cruise ship entertainment in favour of live music showcases of everything from Motown and opera to an all ABBA revue. The bigger ships have dedicated smoking lounges while others confine smokers to defined areas on the open deck. The bigger ships sometimes feature “art auctions” with paintings perpetually cluttering up public places, and also have ship's photographers and contrived photo opportunities, which the smaller ships eschew. Some Asian cruises operate a two-seating policy at meal times. This means a first sitting commencing at 6.30pm with second sitting at 8.30pm. There would be two cabaret performances in the evenings too so that all guests can see the shows. At lunchtime there is a buffet served on deck or in a deckside restaurant, as an alternative to having lunch in the more formal atmosphere of the restaurant. Breakfast is usually a buffet, either deckside or in the restaurant. The peak time for cruising in Asia through the Indian and Pacific Oceans is from October to April and there are three kinds of cruise vessel. Catering for the mass market are the larger liners such as those of Royal Caribbean, Princess and Holland America. 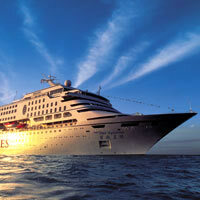 Mid-size ships are operated by Oceania, Crystal and Celebrity cruise lines. 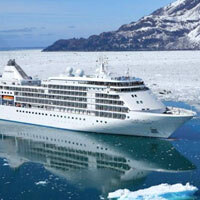 Riding the crest of the wave in the small, luxury cruise ship category are Silversea, Seabourn and Regent Seven Seas. The smaller ships base themselves in the area for the season while the larger ones, such as Queen Victoria, pass through as part of an annual round-the-world voyage. For people with no fixed schedule and who like their own company, there are also passenger-carrying container ships that have taken over from the tramp steamers of old. 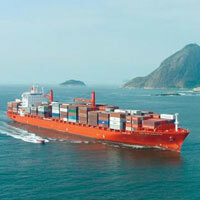 Although some container ships do take passengers, the voyages can be long and uncertain. Romance is lost to the crush of containers and dining is reserved to ship’s fare with a handful of passengers and officers. You could also be pleasantly surprised. The chef has his hands free from wall-to-wall buffets and is often able to rustle up genuine delicacies. Cargo ships have basic to excellent accommodations and a huge selection of movies. Most passenger freighters take four to twelve passengers. Tramp ships of yore are giving way to sleeker vessels catering to the well-heeled and there are some excellent freighter ship cruises available. The much awaited Kai Tak Cruise Terminal (www.kaitakcruiseterminal.com.hk) opened mid June 2013 to mixed reviews as taxis fought to find a way in and permits were demanded (then scrapped) and cruise passengers scurried around a largely empty mall space as retailers have been slow to arrive. Yet it is a gleaming futuristic enterprise (in the former city airport), far outpacing the small and cramped Ocean Terminal in Tsim Sha Tsui, Kowloon, and picked up speed and tenants. By late 2018 it was getting into its stride after initial teething problems with shop vendors and taxi arrangements. Royal Caribbean's Mariner of the Seas is using this new facility as a home port with short sailings to Taiwan (Kaohsiung and Taipei) before switching to Singapore for a winter berth. Mariner of the Seas is a 3,000-pax ship. The year 2016 also welcomed visits from Celebrity Millennium, MV Nautica, Queen Mary 2, MV Seven Seas Voyager, Costa Atlantic, MV Balmoral, Sapphire Princess and Quantum of the Seas. This may be an ongoing trend in 2018/2019 and 2020. Costa Serena, a 114,500-ton behemoth that carries up to 3,780 guests, joins Costa Victoria in Asian waters operating in the China region from April 2015. This brings the Costa Cruises commitment up to three vessels in this region. Berthed in Shanghai, Costa Serena brings its touch of classical Europe to the port. Guests can enjoy the lavish 6,000sq m Samsara spa, a 4D cinema, an F1 racecar simulator, water slides, theatre, a disco to get your dancing shoes busy, and casinos for high rollers. This ship operates five to six-day cruises to Asian destinations including in Japan and Korea. US-based Maris Freighter Cruises offers a wide range including round-the-world cruises on multi-purpose cargo ships (including Rickmers) carrying containers and up to 12 passengers though four to five is the norm. The ships have two double and three single cabins with showers, mini-fridges, TV and DVD/VCR sets and shared facilities include an exercise room and swimming pool. Voyages can be broken up into segments. One itinerary,which starts in Singapore and ends in Italy includes ports in Thailand, Vietnam, Hong Kong, Shanghai and other stops in China, Japan, the US West Coast, Panama Canal, Houston, New Orleans, Philadelphia, Antwerp and Hamburg. It takes approximately 120 days and costs about 8,000 euros per person. Another interesting trip is the North America to the Far East jaunt which starts in either New York City or Long Beach California and travels through Japan, Malaysia, Singapore, Vietnam and China before heading back to USA. Maris Freighter Cruises includes options like the ZIM San Francisco (from Savannah New York or Halifax via the Panama Canal to California, and transpacific to Russia, Korea and northern China) then the CMA CGM Line (from Shanghai via the Suez Canal back to New York). Total time at sea between the two ships is about 75 days and the total fare (including port fees) starts from 7,000 euros/US$9,520. In addition to offering an informative website about cruise and freighter travel, Maris also runs a Cruise and Freighter Travel Club, which offers regular newsletters and further discounts on cruises. Freighters and creaking cargo ships may be the bottom end of the Asian cruising pecking order but they can be fun. Crystal Cruises (www.crystalcruises.com) operates two vessels – the 1,070-passenger Crystal Serenity, redesigned to the tune of US$17 million in 2013, which includes a casino, theatre, library with more than 3,000 books, CDs and DVDs, computer hub, retail shops and cabaret club and the 922-passenger Crystal Symphony, whose recent US$23 million refurbishment saw the addition of a new casino and nightclub. The group introduces the 539ft 20,000 tonne Crystal Endeavour in 2020 with a two-storey solarium and 100 suites. Want more? There's two helicopters and even one submersible. It is described as a "luxury expedition yacht" designed for Arctic sailings. Crystal Serenity has a 21-day '3 Jewels of the Indian Ocean' Perth to Cape Town sailing Feb/Mar taking in Mozambique and Mauritius. Typically, sail Singapore to Bali for 12 days on the Crystal Symphony for $3,110 per person, or Hong Kong to Los Angeles for 37 days departing in November priced at $11, 770. 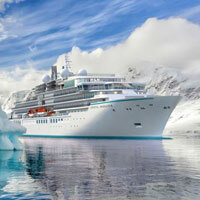 The Crystal Serenity meanwhile cruises the Americas. For all Crystal Cruises be sure to check their free air programme to see if you qualify for complimentary airfare. 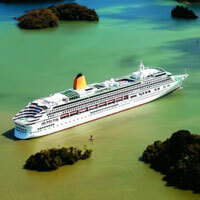 Italian cruise line Costa Cruises, of Concordia infamy, offers short and longer Asia cruises. A typical vessel has nine decks (eight for passengers), and features hand-cut Carrara marble and fine-wood walls. Costa runs cruises all over Asia like a four-day Singapore-Thailand-Malaysia jaunt (roughly US$629 per person) or a 98-day journey that begins in Italy and drops in to Mexico, USA, New Zealand, Australia, China, India, UAE (US$19, 329 per person). It is worth checking out the website as the company runs different Asia cruises every month. You might look at an Italy-Greece-Oman-Jordan-Israel-Maldives-Seychelles cruise specially priced at around 1,800 Euros for advance bookings, or typically a seven-night Maldives-Sri Lanka-India jaunt on the Costa neoClassica at around 639 Euros for an early purchase. That's 44 percent off the normal rate. The sailings commence in Bombay (Mumbai). For Christmas there's usually music and fun for the family on Costa Victoria, which does a five day and four night cruise from Singapore to Langkawi. To add to the festivities, well known Asian pop stars are often in attendance. There are dozens of live-aboard boats available for charter in the Maldives and these are popular with divers as well as those who want to visit islands beyond the 90 devoted exclusively to hedonistic tourism. There's a formidable dive centre on board along with a fun-in-the-sun party atmosphere (drinks are included in the fare) on Atoll Explorer. This small vessel (20 cabins, some with balcony, for 40 passengers) has been operating all-inclusive weeklong cruises throughout the Maldives since 1996 and has become so popular it can be booked for months in advance. Cruises are generally taken as part of a Maldives holiday package but can be arranged independently with diving an extra cost. It is the perfect way of cruising around tropical, palm-fringed desert islands in an exclusive, laidback style. One highlight is a visit to the spa at Kandholhudhu. Get a herbal rubdown in a spa pavilion under swaying palm trees or opt for a beauty treatment. This island offers good and accessible snorkelling within the protected house reef. Gawp at small sharks and stingrays. The Atoll Explorer is moored at Kurumba (about a 20-minute boat ride from the international airport). Back to the open seas. One of The Yachts of Seabourn ships (www.seabourn.com/) visits Asia every year. Seabourn Pride, for example, is an admirable combination of small-ship ambience with big-ship spectacle. With 104 suites, she never has more than 208 passengers, who soon get to know each other at the restaurant, by the pool, in the small casino, or in the bars (most drinks, including in-suite champagne on arrival, are complimentary). 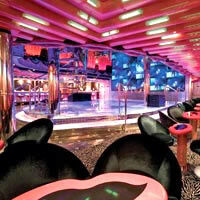 There is entertainment by professionals every night in the ship’s theatre or lounge. 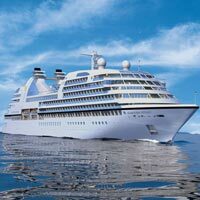 In late 2016 the Seabourn Encore marked the group's fourth new ship in seven years, aimed at the 'ultra-luxury' cruise market. This is luxury on a smaller scale. A typical cruise with Seabourn Sojourn - the the 16-day trip in late December - is a Singapore roundtrip including stops at Port Klang (Kuala Lumpur), Penang, Port Blair (Andaman Islands, India), Yangon, Phuket, Langkawi, and Malacca (Malaysia). Or sample the Seabourn Encore for a 10-day tropical escape - Singapore to Bali via Surabaya and Komodo (remember the dragons?). 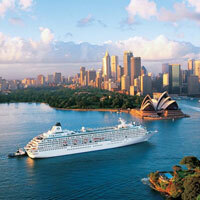 Seabourn Encore also does a 16-day run from Auckland to Sydney, touring Wellington, Akaroa, Melbourne and Geelong. Check out its 'Ultra-Luxury Arabia, Africa & India Cruises' to find the journey that fits your needs. The November 18-day 'Jewels of Arabia and India' is a popular route from Dubai to Singapore, taking in Muscat, Mumbai, Cochin, and Phuket. Tipping is not required or expected on board but if you go ashore on an excursion take some money for local guides and drivers. Government and port taxes are extra and could add another US$400 to the cruise cost. At 32,000 tons Seabourn Odyssey is three times the size of her sister "yachts" and carries double the number of passengers in 225 suites, 90 percent of which have balconies. Special features of the cabins are granite bathrooms, in-suite bar and flat-screen televisions; there is also a two-storey spa and waterfall and Seabourn Square – a lounge with library and cafe. The youngest ship is the 225-suite Seabourn Quest, which joined the fleet in June 2011 and is virtually identical to Seabourn Sojourn and Seabourn Odyssey. Regent Seven Seas Cruises (www.rssc.com, formerly Radisson Seven Seas Cruises) has four ships, two of which cruise regularly in the region, the Seven Seas Mariner and the Seven Seas Voyager. Both ships carry 700 passengers in suites, each of which has a balcony, and both have casinos, show lounges, fitness centres and enrichment programmes. Seven Seas Voyager cruises include itineraries like a 16-night Hong Kong, Xiamen, Shanghai, Hiroshima, Kyoto, Seoul, Incheon, Dalian and Beijing voyage. All-inclusive fares may start at US$4,299 or so. There are similar cruises throughout the year. The Seven Seas Mariner, which underwent a recent renovation, cruises New Zealand and Australian ports, Tahiti and even on to South America. Check the website for full year itineries. Royal Caribbean International (www.royalcaribbean.com) has 22 ships boasting spacious public areas and friendly atmospheres. For top Asian cruising in the region the line has one of its glitziest and brightest ships (glass lifts, floor-to-ceiling windows, rock climbing wall and nine-hole miniature golf course), Legend of the Seas. With a passenger capacity of 2,074, this 70,000-ton vessel is looked after by a crew of over 700. She mainly operates four to nine-night cruises like the five-night “Thailand Explorer” cruise that typically starts in Singapore, then Bangkok, Ko Samui, and back to Singapore. Prices start from around US$1,000. There are also Australia-based departures. Departing from Hong Kong, Legend of the Seas does a typical seven-night sail to Singapore touching Sanya (China), Nha Trang (Vietnam), and Ho Chi Minh City (Saigon). Look out for the new Symphony of the Seas (launched with Miami salings from November 2018) with its focus on family fun with distractions like night laser tag and the 'Ultimate Family Suite' with two storeys of amazing features like an in-room slide, air hockey, and table tennis. Oasis of the Seas is a seven-storey behemoth with 'seven neighbourhoods' with a high dive pool, a zip-line for high seas adventure, rock climbing walls, and the verdant Central Park with 12,000 plants. Royal Caribbean does several short Malaysia/Thailand cruises from Port Klang to Phuket with four nights setting you back around US$450. Or look for five-night Hong Kong to Nha Trang (Vietnam) cruises. 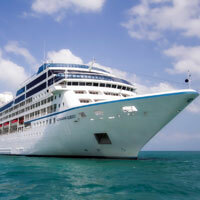 Oceania Cruises (www.oceaniacruises.com) and the line's mid-sized ship, Nautica, which holds 684 guests has become a regular visitor to the region. The ship underwent a multi-million dollar renovation in the second half of 2014, so expect updated décor, modern bathrooms, additional dining options and an array of deck games (think mini golf with a view of sea and sky). Scheduled activities on board on sea days include wine tasting, culinary demonstrations, spa retreats and arts and craft classes. Menus change on a daily basis. Interesting two-week options may take in a Singapore-to-Hong Kong cruise on Nautica, touching the island of Koh Samui (Thailand), Bangkok, Sihanoukville (Cambodia), Da Nang (Vietnam), and Hanoi (Vietnam). You’ll need to request a quote from the website to find out the fares and actual itineraries for 2019 and 2020. Nautica often features a 15-day voyage Singapore to Hong Kong in January cruising the Gulf of Thailand, with calls at Koh Samui, Bangkok, Sihanoukville (Cambodia), Saigon, Danang/Hue (Vietnam), and Ha Long Bay (a short drive to Hanoi). All this at around $5,400 per guest. There are also 16 to 20-day adventures from Hong Kong to Beijing (Taipei, Okinawa, Kyoto, Hiroshima, Shanghai, Seoul, Dalian), Beijing to Tokyo (Dalian, Seoul, Shanghai, Ishigaki, Okinawa, Kyoto, Nagoya) or Tokyo to Bangkok (visiting ports in Japan, Taiwan, Hong Kong, Vietnam). Oceania’s latest liner is the 66,000-ton Riviera, which debuted in May 2012. Like its sister, Marina, it hosts up to 1,250 persons (double occupancy). Oceania Cruises has several two-for-one offers that are regularly available (mainly in Europe and the US), along with special rates, shipboard credit and price reductions. In 2015, Holland America’s MS Volendam and MS Rotterdam headed to Asia for a variety of cruises. 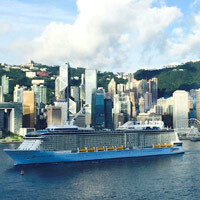 The majority of the ship’s new routes are 14-day voyages between Hong Kong and Japan. Two longer trips, the 28-night “Far East and Asian Adventure Collector” and a 48-night passage from England to the Far East are other options. There are a number of departure dates so check the website for itineraries and prices (www.hollandamerica.com). Big player Star Cruises (www.starcruises.com) is dedicated to onboard fun, complete with casinos, cabarets, buffets and a relaxed Asian ambience where “elegant casual” dress is the most that is required for the gala dinner. It is a cruise line entirely dedicated to cruising in Asia, for Asian tastes and exclusively to Asian ports of call. There is a “no tipping” policy but room service, dining a la carte in theme restaurants, beverages, government taxes, port charges and passenger handling fee are extra and there is a fluctuating fuel surcharge. In late 2016 the company took delivery of the first of two brand new mega-cruise ships. That's enormous. A Star Cruise outing could be a mundane one-night Hong Kong-Nansha cruise, or a five-night Christmas cruise Singapore to Penang. The 75,338-ton Superstar Virgo with a capacity of 1,870 passengers, runs weekend, two-night and three-night cruises out of Singapore every month. According to the cruise length, ports include Malacca, Penang, Kuala Lumpur, and Phuket and “high seas” (the weekender). There are 11 restaurants on board with free dining (up to six meals a day) either as indoor and outdoor buffets in the Chinese family restaurant or the Bella Vista for international dining. Other restaurants attract a premium. Her sister ship, the Star Pisces with 626 cabins operates some of the best one-night cruises to nowhere regularly out of Hong Kong. These are some of the best short-sail options for Hong Kong weekend cruises and Singapore cruises. Superstar Libra regularly makes short round trips to Thailand from Penang stopping at Phuket and Krabi. There are four to five sailings per month. Prices are slightly less expensive for Hong Kong and Macau residents. The 765-cabin Superstar Aquarius does short trips to Sanya and Vietnam and made its inaugural visit to Palawan in the Philippines in 2014. Short Asian cruises, as well as Pacific, Australia and New Zealand sectors, are also available on P&O’s (www.pocruises.com) Asian and Pacific fleets. The Pacific Jewel departs Australia several times, typically cruising through Indonesia (the 12- night “Indonesian Adventure” at A$1,265 per person), Southeast Asia (14-night “Southeast Asia Explorer” at A$1,379 per person). The Pacific Eden also has cruises with similar timeframes, to Indonesia, the Andaman Islands, and Thailand, but departs from Singapore. Pacific Dawn has seven or 10-night trips leaving from Australia to the Pacific Islands with prices starting around A$1,298 per person. If you prefer departing from Auckland, Pacific Pearl is your ship, which also sails to the Pacific Islands. Prices start around A$1,126. 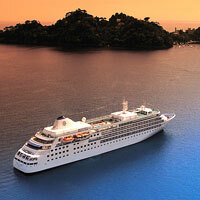 Pacific Dawn and Pacific Jewel also cruise Australia only, and new ports of call have been added. Passengers on other liners speak with awe about the Silversea (www.silversea.com) ships whenever they are spotted in port. The company describes its fleet’s suites as offering the highest ratio of space-per-guest of any fleet, and 80 percent of its suites have furnished teak verandahs. Asia cruises, as indeed all sailings, feature lectures by historians, ambassadors, state leaders, authors and geographers. All ships offer WiFi throughout. It's not just the sophisticated ambience of a Silversea ship that makes it special; everything – even boarding and disembarking – is smoothly run. Your privacy is sacred, yet camaraderie abounds, aided by a staff-to-guest ratio of almost one-to-one. With all spirits and cocktails (including Pisco Sour), fine wines, three famous brands of champagne included in the fare, and service by intelligent, knowledgeable staff, these ships deserve their awesome reputation. Silversea offers a variety of short to medium length cruises in Asia from the basic Singapore to Hong Kong trip to a 16-day Tokyo to Hong Kong trip (around US$9,500). Watch for the signature World Cruises that normally leave San Francisco in January on a 116-day blue water voyage to Monte Carlo taking in 62 destinations, like Hawaii, the South Pacific, New Zealand, Australia, Bali, Shanghai, Hong Kong, Singapore, India and the Middle East. Silversea added to its 'expedition fleet' in November 2017 when Silver Cloud brought its muscle to explore remote areas like Ampangorinana, Nosy Komba (Madagascar), Seychelles, Maheshkhali Island, Bangladesh, Vanuatu, and Grimsey Island, Iceland. Silver Spirit and Silver Discoverer cruise around New Zealand and Australia with trips lasting from between nine and 23 days. There are plenty of departures and fare enquiries can be made through the website (www.silversea.com). Watch for fun runs like Bali to Phuket on Silver Discoverer with 14 days priced at US$7,200 or Toyko to Hong Kong (16 days on the Silver Shadow) at US$10,200. Sailings in September 2018 - similar cruises will be on offer about the same season in 2019 and 2020. 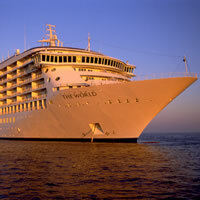 “Travel By Design” is the option offered by the all-apartment ship The World. Sailing the globe year-round, its “floating residences” of varying size can be rented or even bought. For a minimum of six nights, passengers can cruise from and to wherever they fancy on the ship’s itinerary at a price that is for two people sharing and includes dining, select beverages, gratuities and port charges. The concept sold is an adventurous but relaxed lifestyle. Earlier itineraries have begun in Singapore, then cruise on to Southeast Asia, Maldives, Seychelles, Africa, Morocco, the Mediterranean, the UK and Iceland. On the boats go to Greenland, Canada, the US, Panama, then down the west coast of South America. 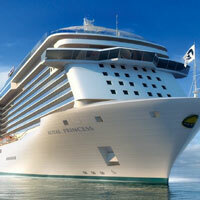 The Princess Cruise Line has 16 ships, with the Royal Princess debuting in 2013 and Regal Princess operating by 2014. Ranging in size from medium to big, the fleet visits the Asian and Pacific regions several times a year. Onboard atmosphere is bright and cheerful. Sample the 24-hour buffet every day included in the fare, or splash out on a meal at a speciality restaurant. Segment fares are available on world cruises and are competitively priced. Dawn Princess weighs in at 77,000 tons and carries 1,990 passengers. The smaller (30,277 tons, 680-passenger) Pacific Princess pops up on her world cruise in Osaka (Japan) bound for ports in Korea, China, Vietnam, Thailand and Singapore, ending in Venice (Italy). Both the Pacific and Ocean Princess have mostly adult guests. The 77,000-ton, 1,990-passenger ship Sun Princess operates cruises to and from Australia. She makes other cruises in the region with a 25-day round-trip cruise from Sydney (Australia) taking in ports in Indonesia, Vietnam, China, Hong Kong Japan, and Singapore. The larger Diamond Princess, at 116,000 tons and 2,670 passenger capacity, cruises between Beijing and Singapore, via South Korea, Japan, China, Vietnam and Thailand. It does Japan-only trips, but also heads farther afield with its Australia to China cruise from Sydney to Beijing. Another sample itinerary is the extended 38-day roundtrip cruise from Auckland (New Zealand), on the Sea Princess, covering Australia, Tasmania, Taiwan, China, Hong Kong, South Korea, and Japan. The aforementioned Ocean Princess, a smaller vessel with a capacity for 680 passengers, has several cruises of varied itineraries between Sydney and Singapore, and Singapore and Italy, as well as jaunts around Tahiti. For those who can’t get a month off from work, there are more manageable Asian cruises from the Princess Cruise Line, including two-day trips around Australia. Ocean cruise line Cunard has been in operation since 1840 and runs a number of famous ships, notably Queen Mary 2, Queen Victoria and the new Queen Elizabeth – the third Cunard ship to be named Queen Elizabeth. Queen Elizabeth 2 (QE2) made its last transatlantic crossing in 2008. Cruising on a Cunard Queen has great social prestige and snobbery pervades the atmosphere. Passengers dine according to how much they’ve paid, with restaurants and even some bars being off-limits to those who haven't paid top whack. Yes, it's the old-fashioned first, second, third class system in operation. In October 2010, the new Queen Elizabeth said toodle-oo to its home port of Southampton and set sail on its first maiden voyage to the Canary Islands. The Italian-built vessel made its first round-the-world cruise in March 2011. Continuing the illustrious legacy of its predecessors, the ship combines art deco glamour with an air of old-style decorum. Pop in your monocle and admire the rich wood panelling, cool marble floors, intricate mosaics and gleaming chandeliers. There are 1,046 staterooms of which the majority have balconies. There are six room types, each paired with a sea-view restaurant. Those splashing out on a top-category cabin will have access to the exclusive Queens Grill and The Grills Lounge where you can dine at any time. It would be a frightfully spiffing idea to bring along your stiff upper lip for a game of croquet or bowls before an English garden party on deck nine. 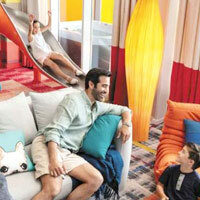 There is WiFi access in every room and while you play tennis with pros, your kids can let loose in the Play Zone. Tiny tots (and lascivious grandpas) can hang out with the team of British nannies. You can’t get more English than that. The Queen Elizabeth often does an epic 120-night cruise from Southampton through the Panama Canal to San Francisco, and on to New Zealand, Sydney, from Honolulu to Sydney, Kobe, Shanghai, South America, and the Canary Islands. Decide which bit you prefer. Or go whole hog with the Stateroom fare at a trifling HK$155,990. A Balcony room will set you back HK$245,685. 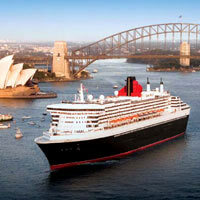 Queen Elizabeth 'Grand Voyages' for 2019 and 2020 take in a similar Southampton-Melbourne and Sydney-Tokyo. Or try a more exciting 27-night Japan-Alaska run in May. The other new Cunard vessel, Queen Mary 2, seems cast from the same mould being billed since her launch in 2004 as "the most magnificent ocean liner ever built". At 151,400 tons, she carries a maximum of 2,592 guests in shameless luxury (Queen's Grill accommodation), to bargain basement, actually Deck Four inside cabin (Britannia accommodation). She sails from Southampton to Singapore, or Sydney back to Southampton (39 nights and slightly less expensive). The annual round-the-world voyage of the old Queen Elizabeth 2 was taken over by Queen Victoria. 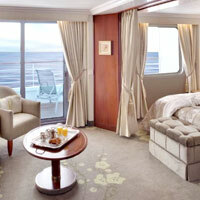 The 90,000-ton ship offers 900 staterooms (639 of which have balconies) for 2,000 passengers on 12 decks. There are guest speakers on board specialising in psychology and history. In 2017 Queen Victoria sailed to Brazil (up the mouth of the Amazon River), New Zealand, Sydney, San Francisco and Hawaii. The full 120-night itinerary Southampton to Southampton is priced at around HK$155,000. Watch for similar routings. A relative newcomer to round-the-world cruising is Balmoral (the newest liner, refitted in 2008), of the popular Fred Olsen Cruise Line (www.fredolsencruises.com) fleet. At 43,537 tons, Balmoral has 738 cabins for 1,350 passengers and lots of entertainment but, according to the company, preserves “the homely atmosphere that is the company’s trade mark”. The Balmoral departs Southampton in January to Asia, and then takes short jaunts (between 15 and 44 nights) between destinations in Asia, such as Kuala Lumpur to Hong Kong or Tokyo to Hong Kong. Another Fred Olsen ship, the Black Watch, makes occasional round the world cruises including stops in New Zealand, Malaysia, Brunei, Papua New Guinea, Australia and Singapore. A trip like this runs to at the very least to £7, 200 or more. Azamara Club Cruises refurbished the 30,277-ton Azamara Quest in 2007, which carries a maximum of 694 passengers served by a crew of 408. Suite guests benefit from butler service and free access to speciality dining (stateroom guests must pay a cover charge of US$25). Fares are inclusive of tips for housekeeping, dining and bar staff and guests receive complimentary red and white wine with lunch and dinner. A wide variety of trips from Hong Kong, China, Singapore and India are offered aboard the Azamara Quest, including 16-night cruises from India to Malaysia, linking up Singapore, Malaysia, Colombo, Oman, and UAE. Prices from around US$6,000. Sister ship, the Azamara Journey, cruises mostly around Europe, so look for the Quest when searching the website (www.azamaraclubcruises.com). For a more intimate getaway, take a peek at the itineraries from boutique cruiser SeaDream Yacht Club, which launched its maiden season in Asia with 18 voyages through 2014. You’ll need to check the website (www.seadream.com) for possible Asia cruises in 2019 and 2020. Also appealingly intimate is Windstar (www.windstarcruises.com), returning from a 10-year hiatus to French Polynesian waters. Select seven or 11-night cruises are offered on an intimate, all-balcony cabin yacht. Ducking into teeny Tahitian coves with overnight stays in Bora Bora, Ralatea and Moorea, this is a trip for those that enjoy a quieter, more personal scene. Cruise dates typically run from June through November and prices start from US$2,499 per person. For small hops in the Indian Ocean, Deep Blue Dive Centers operates cruises aimed at divers and sun worshippers. 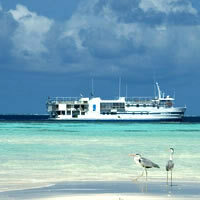 On the 30-cabin Yasawa Princess, round trip journeys from Kurumba last between seven and 14 days. The northern trek drops anchor in Kuda Bandos, Velidhu, Meerufenfushi, Sandbank, Dhiggiri, Hangnaameedhoo, and Malé before heading back to Kurumba. Farther north in Goa, India, the Goa Tourism Development Corporation runs super quick tours (day, evening) on the Mandovi River aboard the 200-passenger Santa Monica or the 24-seat Poseidon. The “Backwater Thrills” journey, for example, departs Tuesday through Friday at 9.30am and travels to the islands of Chorao, Divar and Old Goa, stopping at a spice plantation where travellers enjoy a lunch of traditional cuisine, before returning at 4pm. For an entirely different kind of cruising consider a river cruise. The Road to Mandalay river cruiser by Belmond (formerly the Orient Express) has long been a luxury traveller favourite. 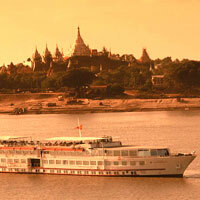 It offers a series of trips, all consisting of cruises up and down the Irrawaddy (Ayeyarwady) River in Myanmar (Burma). The ship itself exudes the understated luxury that is the Orient Express trademark, unfortunately (or thankfully) ersatz cruise ship entertainment is entirely absent from the Road to Mandalay replaced by occasional more subtle cultural performances. Cruises leave every week on trips ranging from three to eleven nights, which run US$2,520 to US$4,030 respectively. Also gliding along Myanmar’s Ayeyarwady River is Belmond’s Orcaella, carrying a maximum of 50 passengers. The fare for an eight-day cruise is about US$5,500 per person. The Mekong River is also seeing more attention from cruise companies, with expanding services from the likes of Avalon Waterways, Viking River Cruises, Uniworld, and AMAWaterways, which have added new ships in recent years. Visiting Cambodia and Vietnam over the course of 15 nights, AmaDara, offers a land and water journey from AMAWaterways (www.amawaterways.com). You’ll spend three nights in Hanoi, and three nights in Siem Reap, before continuing on to Tonle Sap Lake (Siem Reap), Phnom Penh (Cambodia) and finishing with two nights in Ho Chi Minh City. Sister ship AmaLotus carries 124 passengers and is similar in style and substance taking the same journey. The 56-passenger AmaPura, added to the AMA fleet in 2014, sails Myanmar’s Ayeyarwady River for 14 days at a time. For upper Mekong trips into Laos or Yangtze River jaunts through China’s ‘Three Gorges’, look up APT, an Australia-based travel agency that arranges short to mid-length trips on small but charming wooden boats. 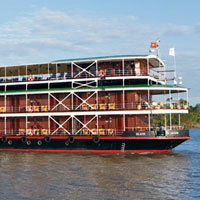 APT also has a new boutique river ship, RV Samatha, which cruises Burma’s Irrawaddy River. You’ll visit markets, temples and villages along the Mekong River aboard Uniworld’s newest ship, the River Orchid, with 30 staterooms and a 60-guest max. 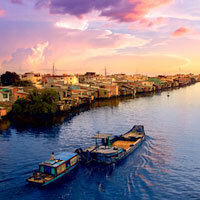 The “Timeless Wonders of Vietnam, Cambodia & the Mekong” cruise lasts 15 days. Uniworld also has options for trips on the Yangtze. Itineraries include 18 days from Beijing to Hong Kong (travel dates between March and October usually) or 11 days from Beijing to Shanghai (between April and October) – note, these itineraries incorporate excursions to various attractions and also involve bus and air travel. Prices vary depending on the date of departure. Avalon Waterways (www.avalonwaterways.com) offers customisable cruises as well as set courses, such as the eight-day journey from Siem Reap to Ho Chi Minh City, making stops in Angkor Ban, Phomh Penh, Chau Doc and Sa Dec. Boats are a bit more intimate, carrying maximum 36 passengers. This run is about once a month and costs around US$2,500 including port charges. Avalon offers “Cruise and Tour” vacations on China’s Yangtze and Burma’s Irrawaddy, never allowing more than 20 guests per trip. Viking River Cruises (www.vikingrivercruises.com.au) has introduced six “Longships” to its fleet, with more in the pipeline. In addition to journeys down the Mekong and Irrawaddy, the company also organizes China trips. For example, the 13-day “Imperial Jewels of China” river cruise visits cities in China, including Beijing, Xian, Chongqing and Shanghai, among others. Several guided tours run the gamut from museum trips to the Three Gorges to a tour of the terracotta warriors. When offered, the cruise starts from US$4,795. Another Viking itinerary takes in Lhasa (by air, of course) so be sure to check the website for details. As Asian cruising increases in popularity, Singapore and Hong Kong have become Asia's main cruise hubs with new facilities handling the biggest cruise liners in the world. However, for smaller more intimate cruises, or river cruises, there are plenty of departure options throughout Asia and Australasia. Just be prepared to trawl through an immense amount of information and choose wisely for whatever might suit your individual needs. That’s the long and short of Asian cruises. Don your hat, pour on the sun-block, and head off for some wild adventures. Or hop on a tramp ship and do an Asian freighter cruise in less wallet-pinching style. 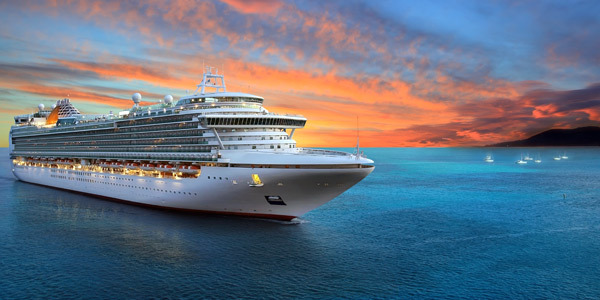 By booking your Asian cruise through a reputable cruise travel agent it is sometimes possible to get discounts on brochure prices, especially close to sailing date if the ship has not been fully booked. Asian cruising discounts are also available for those paying in full and booking a long time in advance, and for repeat passengers. Discounts are often to be had through cruise liners’ websites. Always scout around for special credits on dining and airfare. Shipboard purchases and bar bills are charged to the cabin account for settlement by approved credit card at the end of the voyage. Travel insurance is compulsory. Fares where quoted are approximate and are either the average per person, per day, or brochure price per cruise based on two people sharing a double cabin. Below are some cruise companies that have voyages through Asia during 2019, 2020 and beyond. APT. Tel: 1-300-336-932 (Australia), (www.aptouring.co.uk). Avalon Waterways. Tel: [1-877] 797-8791, (www.avalonwaterways.com). Azamara Cruises. Tel: [1-877] 999-9553, (www.azamaraclubcruises.com). Belmond River Cruises. Tel: 1-800-524-2420, (www.belmond.com/river-cruises). Costa Cruises. 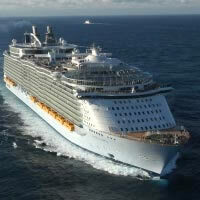 Tel: [44-845] 351-0552, (www.costacruisesasia.com). Crystal Cruises. Tel: 888-722-0021, (www.crystalcruises.com). Sold through travel agents only. Dream Cruises. 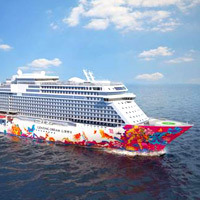 Tel:  2317-7711 or  6223-0002, (www.dreamcruiseline.com/en/). Deep Blue Dive Centers. Tel:  334-4627, fax: 334-4625, (e-mail: info@deepbluemaldives.co or deepbluemaldives.com). Fred Olsen Cruise Lines. Tel: [44-1473] 742-424, (www.fredolsencruises.com). Goa Cuises/ GoaTourism Development Corporation. Tel: [91-832] 222-6515, (www.goa-tourism.com). 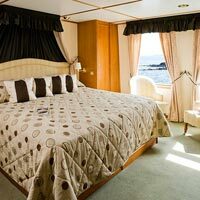 Hebridean International Cruises. Tel: [44-1756] 704-700, (www.hebridean.co.uk). Holland America Line. Tel: [1-877] 932-4259, (www.hollandamerica.com). Maris Freighter Cruises and Freighter Travel Club Int'l. Tel: [1-800] 996-2747 and [1-203] 222-1500, (www.freightercruises.com). Oceania Cruises. 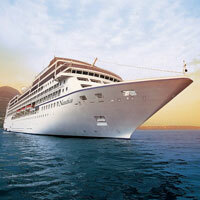 Tel: [1- 305] 514-2300, US toll free:  531-5619, (www.oceaniacruises.com). P&O Cruises. Tel: [44-843] 374-0111, (www.pocruises.com). Princess Cruises. Tel: 800-7746-2377, (www.princess.com). Regent Seven Seas. Tel: [1-800] 251-174 or [1-954] 776-6123 (www.rssc.com). Royal Caribbean International. 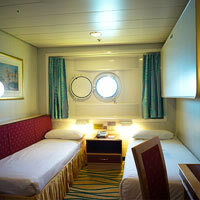 Tel:  6305-0033, (www.royalcaribbean-asia.com). Saga Cruises. Tel: 800-096-0074, (www.sagaholidays.co.uk). Seabourn Spirit. Tel:  626-9179, (www.seabourn.com). Star Cruises. Malaysia tel: [60-3] 2302-1288, Hong Kong tel:  2317-7711, Singapore tel:  6226-1168, United Kingdom tel: [44-845] 201-8913, (www.starcruises.com). The World. Tel: [1-954] 416-3644, (www.aboardtheworld.com). Viking River Cruises. Tel: 1-800-706-1483, (www.vikingrivercruises.com). Windstar Cruises. Tel: 1-888-718-1474, (www.windstarcruises.com).